College was a cinch. Let me show you how. First and foremost, we all have been there. Those sleepless nights, those 8 am classes on Monday where everyone looks like they’ve just stepped out of a zombie apocalypse and who can forget Maggi Mee 3 times a day at the end of the month? In short, life as a student means bad time and money management. Don’t kid yourself. We all have been there. However, do you know that there are simple life hacks that you can easily implement to make your time as a student more manageable while being fun at the same time? The Pareto 80/20 Principle dictates that 80% of all effects come from 20% of the work. Obviously this is extremely useful for those exam crunch times. But do you know that you can apply this to your homework as well? When you are researching for a project or an essay, the top 20 percent of the search result usually has most of the details you need. To put this into perspective, researching the top 5 best sources would ensure that you have all the data you need. Well, maybe not ever, but you could use some toning down on your shopping sessions (yes, this even apply to guys as well). Shop online is fast becoming a more viable alternative. Even though people complain that shopping online is more expensive, think about what you save: bus/train fare, car rental, eating out, time spent shopping and time wasted looking for the things you want. Best part about online shopping is, your purchases can be directly delivered to your hostel. You might also want to hit the online coupons sites such as Harga Runtuh and Durian Runtuh; where you can get coupons to make your purchases even cheaper. Or even better, a US president; which is known as one of the most hectic job in the world. 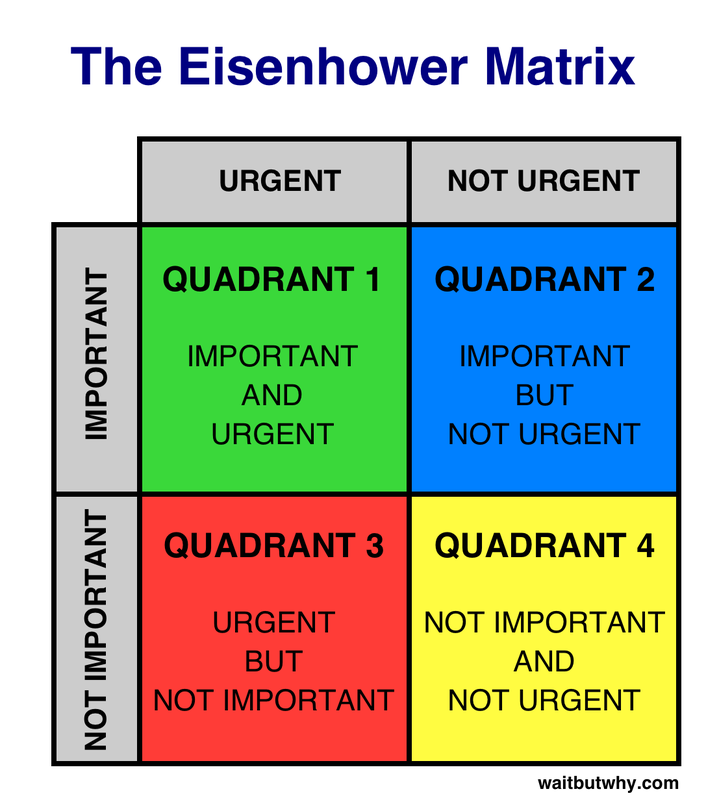 Take a leaf out of Eisenhower’s priority matrix (illustrated below). Most of you might have seen this before but for those of you who hasn’t, it is a box with for quadrants for you to segregate the things that you need to do. Q1 is the urgent-important area, for things that you need to do now, like deadline driven projects or assignments. Q2 would be for asking your professor about something you don’t know or paying your bills - not urgent, but still important . Q3 is a bit tricky since you don’t have underlings but this is where you put things that are not productive, but demands your time such as running errands. Finally Q4 is those things that are pure time wasters, but it is the most important one. What you put in here determines how successful you are in college. Go ahead and give the matrix a shot. Your future self will thank you for it. As a college student, taking time to actually do work is a small miracle in itself. So many things to do yet so little time makes school work being delegated to usually Q3 or Q4 on the Eisenhower Matrix (see above). Right? So if by chance it does get to Q1, here’s how to focus on your studies like a laser beam: Unplug, Work 52 minutes Break 17 minutes. Explanation: Nothing takes away from your focus like the ding sound of your messenger or your phone going off. Unplug all your electronic devices for an hour. Then work for 52 minutes and break for 17 minutes. Repeat. Studies have shown that this is the optimal working pattern of the human mind and you retain most of what you study by doing this. Protip: Pareto your 52 minutes for even better results. 5. Hate first, love later. Do the things that you hate first, and do the ones you like later. This apply to all things, assignments, projects, laundry, you name it. What this does is that, your mind thinks that the things that you hate is actually harder than the ones that you love. So when you complete the task you don’t like, this gives you a psychological sense of achievement and increases your confidence to tackle other jobs. This decreases your stress as well and is a great tool to avoid procrastination. Find it is too hard to start? Confide in a friend. Vocalising your difficulties helps reduce your dislike for the job and usually results in you finding a better way to approach a problem. There you go. These 5 tips should help you sail through college, leaving more time for you to enjoy life and becoming a more well rounded person. You’ll have more time to travel, make friends and most importantly, cultivate a more productive you that will be the envy of all your friends. With RentalCars you can find the cheapest car hires from over 49,000 international locations.